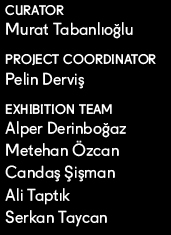 Rather than conducting a historical account of modern epoch in Turkey, presenting an exhaustive catalogue, or trying to capture its unique local attributes, “Places of Memory” attempts to explore the main theme of the biennial via perceptions and experiences. The project idea departs from three areas of Istanbul: The first comprises Taksim, where I was born and grew up. Taksim is also an important square, with a constantly changing appearance because of partial and inconsistent interventions. The Atatürk Cultural Center, situated on the narrower end of the square, is a symbol of modern architecture in Turkey. My father, Hayati Tabanlıoğlu, was the architect. This first area spreads out across a wider zone, and continues downhill from the square to the coast, passes along the warehouses designed by Sedad Hakkı Eldem, an important representative of 20th century architecture in Turkey, reaching Salıpazarı harbor. Like many other areas in Istanbul, this area, too, is undergoing transformation. The GalataPort project (a master plan proposal, 2001) developed by us (Tabanlıoğlu Architects) for the area, and the Istanbul Museum of Modern Art, which we transformed from a warehouse into a museum (2004), were among projects that triggered change in this area. The second area is Bâb-ı Âli, where I spent my youth. Starting in Sirkeci, the area used to host the headquarters of important newspapers and printing houses in Turkey along two sides of the Cağaloğlu slope. I used to pass through this world every day since I studied in a high school in the same area. The final one is Büyükdere Boulevard and its environs. This area, once lined with fields and orchards, later with light industry buildings, today is in juxtaposition with the CBD, featuring high-rise buildings especially between Levent-Maslak axes that connect main transportation routes of the city. A detailed discussion of these places that acted as thresholds during different stages of my lifeor in a sense, my memoryseeded the first layers of the conceptual framework. Our focus in the exhibition is not necessarily on these places, but rather on the concept of place itself, incorporated with the subjective vision of every exhibitor in the team. The works interact with each other via different approaches based on different scales and mediums. We chose not to write in advance the story that might emerge from this project. We will see the outcome together. This is a conscious decision that keeps us on edge, but one that also holds potentials.